Casini, F.; Gens, A.; Olivella, S.; Viggiani, G.M.B. Artificial Ground Freezing (AGF) is a controllable process that can be used by engineers to stabilise temporarily the ground, provide structural support and/or exclude groundwater from an excavation until construction of the final lining provides permanent stability and water tightness. 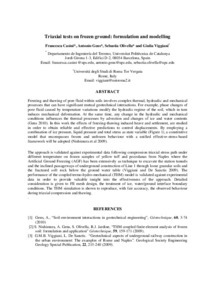 In this work, the process of ground freezing is studied using a constitutive model that encompasses frozen and unfrozen behaviour within a unified effective-stress- based framework and employs a combination of ice pressure, liquid water pressure and total stress as state variables. The parameters of the constitutive model are calibrated against experimental data obtained from samples retrieved during construction of Napoli underground, in which AGF was extensively used to excavate in granular soils and weak fractured rock below the ground water table. Casini, F. [et al.]. Triaxial tests on frozen ground: formulation and modelling. A: International Conference on Computational Plasticity Fundamentals and Applications. "Computational Plasticity XII: Fundamentals and Applications - Proceedings of the 12th International Conference on Computational Plasticity". Barcelona: 2013, p. 534-541.